A Japanese meal differs slightly from the multiple courses that are traditionally found in Western and European cuisine. Whereas an American four-course meal may include appetizer, salad, main course, and dessert—all delivered separately—a typical Japanese dinner at home involves a single course with several dishes presented all at once. While many Japanese restaurants in America and Europe feature smaller plates as appetizers separate from the second (main) and third courses, a typical Japanese meal combines all of these courses into one and is considered dinner, or referred to in Japanese as “gohan,” meaning meal or cooked rice. Following dinner, dessert might be served as the second course. 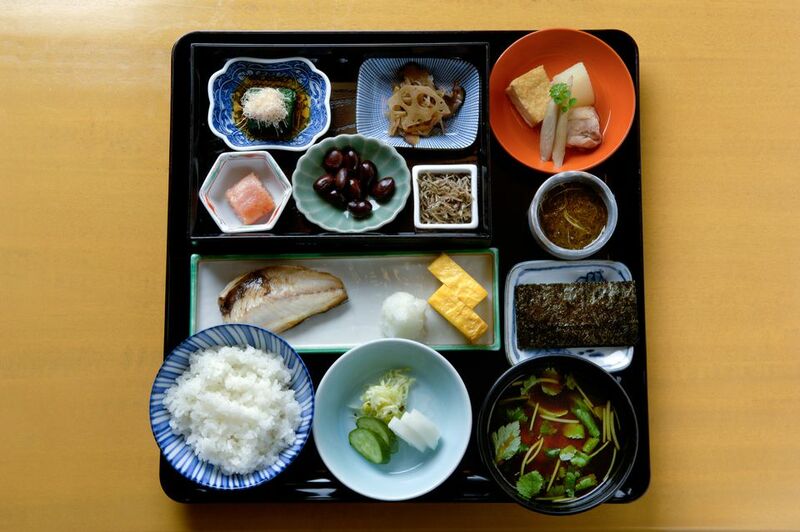 The components of a typical homemade Japanese dinner might include rice; seaweed (nori), furikake (rice seasoning), or tsukudani (topping for rice); soup; pickles; salad; protein; mixed protein and vegetable dish; and vegetables. Beverages are served alongside. Plain rice is often enjoyed at home with seasoned seaweed (nori) or rice seasoning known as furikake which is often a mix of dried vegetables, egg, seaweed, bonito flakes, or sesame seeds. Another type of topping for rice is known as tsukudani, which is a wet seasoning (as opposed to dried seasonings) often made of seaweed or kelp, and might be mixed with dried fish or other seafood. In addition to rice, every Japanese meal includes soup which is almost always served hot. The most common type of soup is a miso-based soup (miso shiru); the variety of ingredients that are included in the miso soup is only limited to the creativity of the chef. Another popular soup is a clear dashi-based soup (sumashi jiru) that can include numerous combinations of vegetables, protein, and seafood. A third and slightly less common type of soup is called consommé, which is more westernized and based on a protein and mirepoix broth. The pickles on the Japanese dinner table are not necessarily similar to the dill pickles we are used to seeing alongside a deli sandwich. Also known as sanbaizu tsukemono in Japanese, this dish is comprised of pickled vegetables or fruit. There are countless varieties of tsukemono that are almost always served alongside rice, from ginger (gari) to plums (umeboshi) to the more familiar cucumbers. In Japanese cuisine, a salad can be a Western-style fresh lettuce salad, but it will also include vinegar marinated vegetables such as in a sunomono with seaweed, cucumber, and ginger, or even cooked vegetable salads like ohitashi, which often features spinach. You may also find kinpira gobo (braised burdock root), a simple Japanese okra salad, and hijiki (seaweed) salad. When it comes to the protein dish, a Japanese meal often involves seafood, given the country’s close proximity to the sea. A piece of grilled or fried fish, sashimi (raw fish), or other seafood might be portrayed as the main course of the meal in Western terms, but dishes like sakana no nitsuke (fish simmered in a sake-based sauce) and kamaboko (fish cakes) are just one of the parts of a Japanese meal. Today, however, this dish is not limited to seafood and includes many other proteins such as chicken, pork, or beef, like in buta-no-shogayaki, stir-fried pork slices. It is not uncommon for seafood and other proteins to be mixed with vegetables and served family-style as the main protein dish. Aside from the main protein dish, there may be a secondary dish of mixed protein and vegetables that are simmered, sautéed, baked, or fried. This dish might also be served family-style. Nikujaga, a stew of beef and potatoes, is an option, as is yakiniku donburi, beef with vegetables. In addition to seafood, Japanese cuisine is also heavily dominated by vegetables. Often, these vegetables are simmered in a dashi broth, sautéed, or simply boiled or steamed in water and served with soy sauce and mayonnaise. Yaki nasu is a popular dish of grilled Japanese eggplant topped with garnishes of ginger, bonito flakes, green onions, and a drizzle of soy sauce. Along with the meal, hot green tea or other Japanese tea will be offered. Cold barley tea (mugicha) is often served during warmer months. Alcohol such as beer and sake are also typical beverages enjoyed with dinner. There are a number of Japanese desserts that range from sweet rice cakes, cakes, sweet beans, gelatins (such as mizu yokan), and frozen treats. Other desserts include fruit and cookies.